In Paris, I was looking forward to meeting one of my long-time computer friends, Susannah Pabot, whom I met in an on-line writing class two years ago, and with whom I continue to exchange writing. The apartment we rented turned out, by great coincidence, to be only a short walk from her apartment, so she offered to meet us with a few groceries: bread, milk, fruit, cheese. The bread was baguette, which we all loved (though by the end of the trip, Eli was definitely tiring of chewing baguette. “Why this French bread so big?” he complained, gnawing away at it.) The milk was full fat, which I haven’t bought since Eli turned 1 (and haven’t drunk myself since I was a kid). In all the markets I visited, I never did see low fat milk; I expect in France there’s a law against the stuff. The fruit — a brown bag of cherries, a handful of apricots, and a melon — was fragrant and perfect. And the cheese… well, I had forgotten, somehow, what to expect with the cheese. 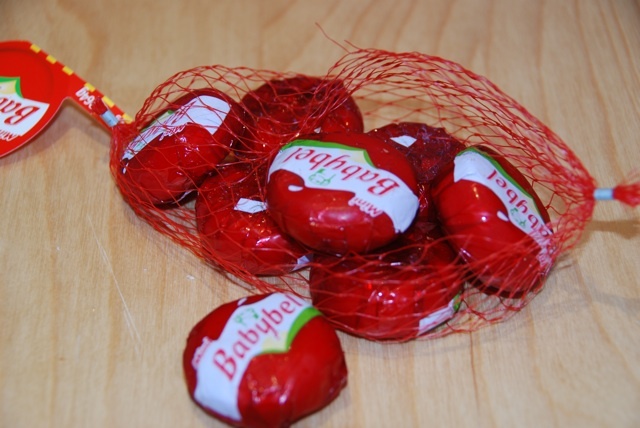 Currently, my children eat Baby Bell cheese (Eli), Monterey Jack (Ben), good freshly grated parmesan (Eli), and the generic grated cheese served at Pasta Pomodoro (Ben). That is to say, as far as the French (and anyone with an even slightly-refined palate) are concerned, they do not eat cheese. And although Susannah brought a lovely soft chevre and a meltingly ripe camembert, she’s the mom of a picky eater and so she did also bring a mild, sweetish hard cheese, comte, which apparently French children like. That is to say, she tried. “It’s all good, the cheese man assured me, today,” she said. Ah, yes, I realized, we are not in Kansas anymore… here in France, the cheese is a living thing, beautiful and tender as fresh fruit. Of course, my children did not touch it. 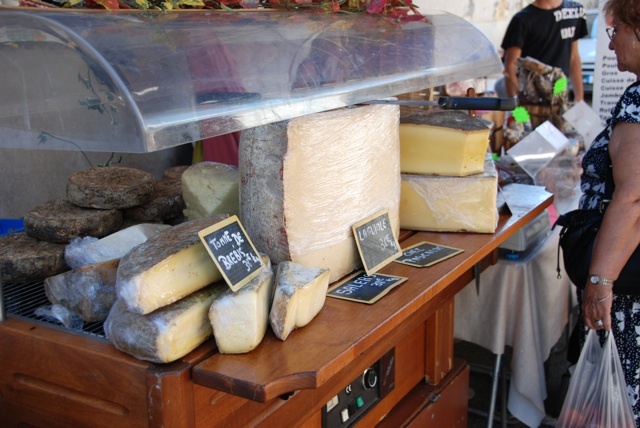 The next day, at the covered market, I stood in front of the cheese stall, nearly knocked over by the heady smell, and left empty-handed– a little wistful, but pragmatic. At the Monoprix market, I bought a 12-pack of baby bell cheese and took it home to my boys. In some ways it felt wrong to bring food to Paris, but traveling with kids has taught us that if you’re going to uproot them from the familiar routine/beds/meals for a time, you’d better pack food. And before that, unless you’re staying with family, you rent an apartment or condo or house — anything with a kitchen– in which to cook it. When we rent a beach house in the Outer Banks with my sister and her family, we fly east and then stock up on staples at the grocery store before driving south. We bring flour, sugar, olive oil, oats, cereals, wine, soy sauce, and vinegars. When we visit friends in Chicago, we rent an apartment and stock up at Whole Foods or Trader Joe’s the first day. Which doesn’t look like much, really, but we ate it all (except the mango), and could have eaten more. Back in the day, when I was a childless graduate student flying the red-eye east for the Christmas holidays, airplane food was easy: a theraflu on take-off to knock me out, a sudafed on landing to get me through the day. But times change. I don’t take many OTC (let alone prescription) meds these days, and with two kids I pack enough food to cover a few meals. I learned on my first flight as a mother, when Ben was just three months old and nursed his way steadily from SFO to JFK, to keep the food coming. 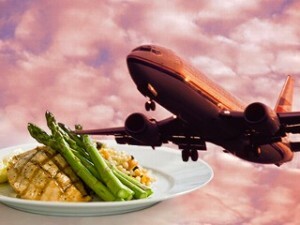 Airplane contentment depends on keeping my kids’ mouths full. We had to abandon the red eye when Ben was about two and the anticipation (and eventual ingestion) of apple juice and animal crackers — snacks he never got at home — kept him from sleeping. Now when we fly east, we travel by day, rousing the kids before breakfast, feeding them smoothies and bagels at the airport, and then sushi and snacks on the plane. Yes, you read that right: sushi on the plane. We pick up vegetarian sushi from Hotei the night before any long flight. This appeals over other possible snacks because it a) is a treat; b) holds up for hours at room temperature; c) doesn’t have a strong smell to annoy our fellow passengers; d) isn’t messy to eat and e) the accompanying pickled ginger helps keeps stomachs calm. Ben eats spinach rolls, Eli eats tamago, Tony eats avocado rolls, I eat oshinko rolls and the leftovers. If sushi and a side of edamame doesn’t get us through, we rely on the steady stream of decent snacks from JetBlue: blue potato chips, chocolate chip cookies, roasted almonds, animal crackers. If we’re low on food when we land and need to restock for the two-hour drive to my parents’ house, we’ve discovered that the JetBlue terminal at JFK, though shabby, has excellent vegetarian snacks, from mushroom dumplings to fresh fruit, carrot sticks, yogurt and granola. Spoiled by JetBlue, we were less well-prepared, then, for our recent flight to Paris. We brought only a five-hour supply of sushi and I didn’t find the British Airways “tuck box,” stocked with individually-wrapped Walkers shortbread biscuits and Cadbury bars, until just before we landed ( of course, I grabbed a handful, which were helpful motivators the first couple days in Paris). We were cranky and hungry when we landed. Plus, the leftover supply of cashews, raisins, dried cranberries and dried mango (now down to a sandwich-sized ziploc) I’d brought east two weeks earlier. We had the palmiers (not so good after all), the carrot and one of the farfalle salads leftover. British Airways also fed us twice, and although the boys weren’t interested in the (most excellent) vegetarian moussaka and spicy chickpea salad, Tony and I ate all that, too. And as I’ve already noted, when we got home we needed dinner. Travel makes us hungry. Getting home, especially after 19 hours of travel, means dropping the bags at the front door, checking the fridge, making a grocery list, and (depending on what time we walk in the door) polling the family about what take-out they want for dinner. Yesterday we’d been home less than an hour before Tony had walked to the market for milk, eggs, and bread, and then picked up unapologetic take-out from the local Chinese restaurant for dinner. Our standard order (unchanged in 6 years): szechuan green beans; millennia veggies (with tofu, brocoli, eggplant, snow peas, shitake mushrooms and carrots), Nanking noodles (fat noodles with chunks of tofu and whole basil leaves) and brown rice. The boys ate heartily, their first balanced meal in over a week. This morning, jet lagged, I was up making granola at 6. We teach our children how to read and write; we teach them how to get dressed and clean their teeth, how to cross the street safely, how to save money and find a job. But how do we teach them to eat? In a time when interest in local, organic and sustainable food is on the rise and concern about nutrition, health, food safety, and the environment makes the daily headlines, how we eat has personal, political, and cultural resonance. What do our daily choices about feeding and being fed say about us? How does the food we eat convey our values—about family, community, environment—to our children and the wider circle of people we feed? How does our food communicate our cultural traditions? And how do our eating habits establish life-long ideas about family, community, and our place in the world? LEARNING TO EAT offers an original and timely perspective on the ongoing cultural debate about how American families eat. Simply put, good eating habits involve more than putting healthy food in our mouths. The “local, organic, sustainable” mantra may be the ground zero of our national discussion—as some of our writers testify—but equally important is understanding that how we learn to eat in our families matters in the rest of our lives—and for the rest of our lives. To this end, LEARNING TO EAT presents essays that explore the full diversity of foods eaten by modern American families and the many different ways we feed ourselves and others. Our writers think about how families celebrate and grieve over daily meals, consider what we do when food is the enemy, and engage in public debates and private struggles over what and how we feed our children. Most important, these writers reflect on what our food choices reveal about our most fundamental values. Readers of our book will confront the role food plays in family tragedies, and understand how it plays a crucial part of the class and culture wars. They’ll get a series of fresh perspectives on our national obsession with weight, including what it means to learn to eat again after weight loss surgery and a diabetes diagnosis. They’ll read about how to get their kids to eat duck confit and what it means when both mother and daughter struggle with eating disorders. They’ll read about learning to bake and they’ll meet adults who never learned to cook. They’ll read, and they’ll know why learning to eat matters in our adult lives. They’ll know, at the end, that food is much more than what’s served to us on our plate, and that there’s more than one way—and more than one reason—to establish a healthy American food culture.